OLD BROOKVILLE. Melding the atmosphere of a Nineteenth Century British country home with the nostalgic charm of a Currier-and-Ives-like New England farm, this delightsome, sprawling estate, in the heart of Old Brookville, will appeal to the romantic in all of us. 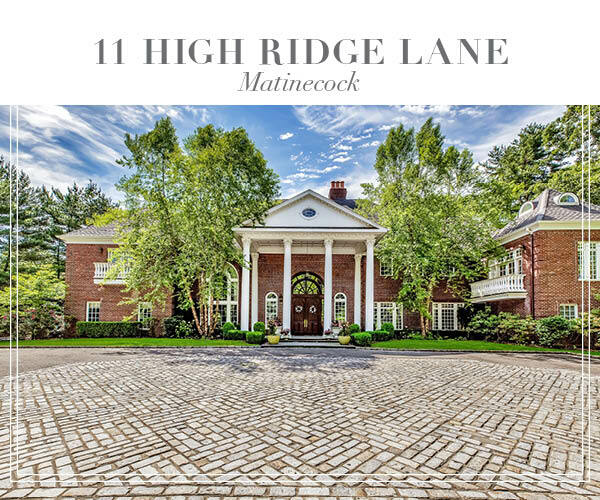 Dating back to the turn of the Twentieth Century, this five-bedroom, six-full and two-half-bath colonial manor was built when the area was transitioning from a community of dairy and horse farms into a land of grand estates. Sitting on nearly ten acres of expansive, rolling lawns flowing amidst a plethora of towering trees and formal gardens, it provides a sequestered retreat ideal for relaxation and entertaining. 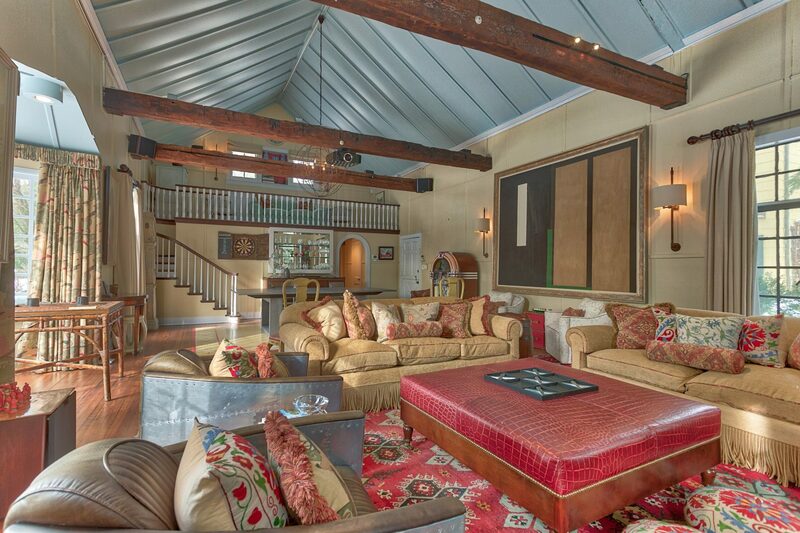 The home’s interior, with its leaded-glass casements, ancient, massive exposed posts and beams, and overall cozy English charm creates a storybook ambiance, yet through renovations and additions, provides all the modern amenities of the Twenty-First Century, from home theater, steam baths, and sauna to huge gourmet kitchen with commercial-grade appliances. Located off a wooded private drive, it is ideally located in Old Brookville. Known for its residential character, private police force, and magnificent homes, it is convenient to public and private schools, boating, golf, equestrian pursuits, charming village shopping and dining, museums, beaches, upscale shopping at the Americana Manhasset and the Miracle Mile and is within a comfortable commute to New York City via train or car. From the gated entrance, a new Belgian-block-lined drive wends past the nearly 200-feet of manor house and guest house to a large circular courtyard and on to a large service courtyard serving an attached two-car garage. A stunning tower rises above an archway to the rear property’s expansive brick patio, shaded by an ancient tree. Across an expanse of lawn, a glistening inground, heated, Gunite pool and brick patio with gazebo promise many pleasant hours of summer fun. A solarium leads to a cabana, bath, and sauna. Brick and stone paths extend across the rear of the house and fork to a splendid formal rose garden and, through a towering arbor, to the guest house and porch off the main house. In the distance, a charming nearly new red barn reminds one of the horses so common in days past. It offers four car stalls, an office/kitchenette, and full bath, plus an unfinished second floor with deck and stairs to a huge stone patio. In another area of the grounds, a tennis court and a lighted Platform tennis court back up to a copse of trees. 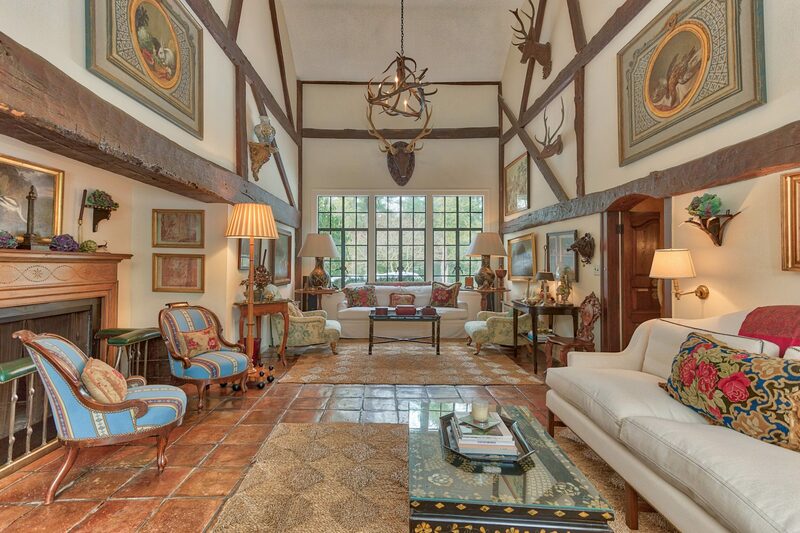 Words cannot adequately describe the main house’s interior, so meticulously and creatively adorned embracing its past with its enthralling post-and-beam construction and its many additions, each with its own character, but an overall ambiance of an Edwardian gentleman’s country home or hunting lodge. Though staying true to its heritage, it manages to offer luxury amenities of today including a lavish master suite with two baths, a gorgeous bedroom with fireplace and balcony, a huge dressing room and many closets; several additional breathtaking bedrooms with baths en suite; a steam bath; cabana room and sauna, generous public rooms, two with fireplaces; a dream of a charming New England gourmet, eat-in-kitchen with butler’s pantry; a generous dining room, both opening to the rear patio; and a guest apartment in a separate wing. This is a home that must be experienced in person, and when you do, you will fall in love! 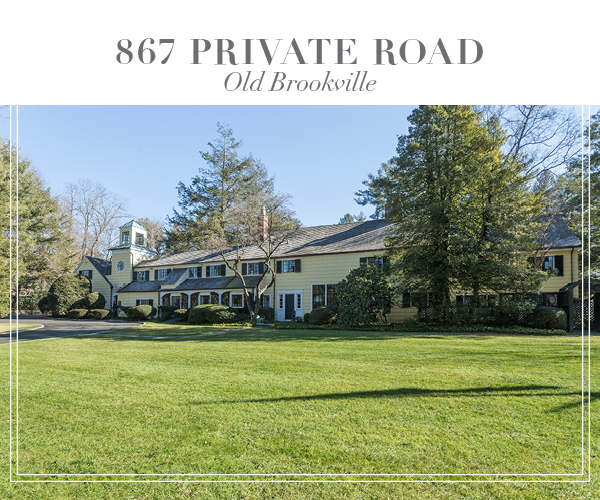 For more information on this charming Old Brookville Estate, click here.